...his abiding legacy is the way he assimilated computers into his daily life and served as an example for other writers. Ebert first logged on to the Internet in 1990 through CompuServe; by 1993 he was using a laptop to e-mail dispatches from the Cannes Film Festival back to his editors at the Chicago Sun-Times. Three years later, in 1996, Ebert pushed the newly digital Sun-Times to put 2,000 of his reviews online for free. The archive dated back to 1985 and was easily searchable by title or star rating. The Internet gave Ebert more ways to connect with his readers, and despite his illness (he was diagnosed with cancer in 2002 and lost the ability to speak in 2006), Ebert actually grew more prolific in his final years. He averaged 200 movie reviews per year (last year he hit a career record of 306), kept a blog, obsessively entered the New Yorker caption contest, and wrote the occasional Op-Ed. But he unexpectedly thrived on Twitter. You're never too old to try social media, nor to try changing the system around you: Did I mention he was 70 when he died, still blogging and tweeting up to the end? That he was 53 when he pushed for putting his reviews online for free? NPR's Scott Simon remembered him as a "Chicago newspaperman who typed with two fingers — it sounded like a machine gun, columnist Bob Greene remembered on Friday — who was from the age when reporters were fueled by ink and booze." And if he could adjust, so can you. Be clear: "Jargon is the last refuge of the scoundrel," he said. Every tweet, every blog post, stayed true to his usual clear prose--and it paid off. Be honest with your readers: On his Sun-Times blog, Ebert wrote about his alcoholism and, better yet, his recovery and relationship with Alcoholics Anonymous--with the irresistible detail about once taking Ann Landers to an A.A. meeting, but more importantly, an authenticity and humility that make this post compelling reading. This post is a great example of what blogging can do: It's not just about him and his story, but in disclosing so many details from his experience, he offers a rare picture that I'll wager made (and still makes) it possible for others to consider this path. Have some social media rules for yourself: It's tough to do better than Roger Ebert's rules for tweeting, with a hat tip to Sarah Milstein for the pointer: "My rules for Twittering are few: I tweet in basic English. I avoid abbreviations and ChatSpell. I go for complete sentences. I try to make my links worth a click. I am not above snark, no matter what I may have written in the past. I tweet my interests, including science and politics, as well as the movies. I try to keep links to stuff on my own site down to around 5 or 10%. I try to think twice before posting." Always be trying something new: In his final blog post, announcing a new digital company for his content and a redesign for rogerebert.com, Ebert also let us know he'd launched a Kickstarter campaign to fund the project. Be your own publisher: Suddath notes at the end of her article that the Sun-Times erected a paywall in 2011, so you'd have to be a registered user to read its very nice obituary for Ebert, the writer who'd given it a worldwide reputation. 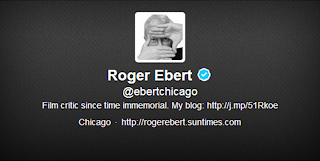 Ebert even had that figured out: You can read the Sun-Times obit for free on rogerebert.com. Balance the snark with empathy and kindness: He was a critic, after all, but it was Ebert's empathy and genuine niceness that prompted the flood of social media remembrances and testimonials last week. People were sharing posts about the personal answer he sent their letters and emails, the time he posed for a photo with a fan, the kindnesses he'd done. Ebert got social, and got relationships, online and off, and it showed. Ebert didn't confine his self-reinvention to social media. 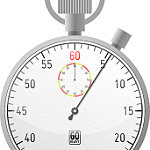 I've written on my public speaking blog, The Eloquent Woman, about how he rethought public speaking and kept doing it even after cancer surgery took away his voice. Boy, are we going to miss him around Twitter.